Once in a while we adults want to have yakitori, grilled chicken skewers, but many yakitori-ya are smoky joints that are not kid-friendly. Iseya in Kichijōji near Inokashira Kōen Park is both family-friendly and a good value. It is also perfect for groups as it is a large space. The only challenge is that it is wildly popular. On weekends there is a perpetual line out the front door. Bring along something to keep your kid occupied while standing in line. First things first, large mugs of cold beer for the adults and barley tea for the kid. We ordered vegetables like edamame, potato salad, green salad, kimchi, and cucumbers to get started. At the same time we ordered a variety of chicken skewers like thigh, gizzard, liver, chicken balls complete with minced cartilage for crunch, and chicken skin. The vegetables come out immediately and just when we are ready for the yakitori a giant plate is placed on the table with the skewers. Inokashira Kōen is a great spot for the kids to run around after lunch. On the north side of the station is a great shōtengai shopping arcade with many food shops. 12 noon – 10 p.m. Walking into Village Voice in Kichijoji I felt like I was up North in Minnesota. The beer signs lining the wood-paneled walls, the beer on tap, and the smell of burgers and fries. It’s a popular spot and we came right after they opened for lunch. Within about fifteen minutes it was packed and then a line started out the front door. Small bites like chips and avocado or onion rings come out very quickly. The burger follows right after. 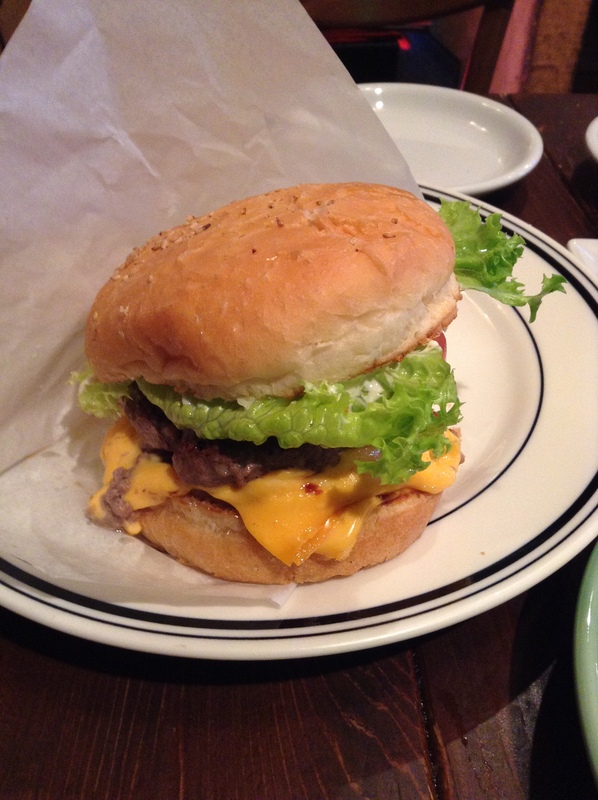 The burgers are more like one will find at a diner, thin and cooked through. Toppings are generous and it’s a satisfying meal. The cheese are gooey slices, Velveeta perhaps? And even the bun has sesame seeds on it. Small things, but something one would appreciate if they spent anytime eating burgers in the USA. The only downside would be making a special trip here to find a long line. So time your visit wisely, either come early or late, but not at prime meal times. The red bar stools facing the kitchen are a nod to Americana. The other diners this day were all Japanese, many of them girls digging into big burgers with glee. 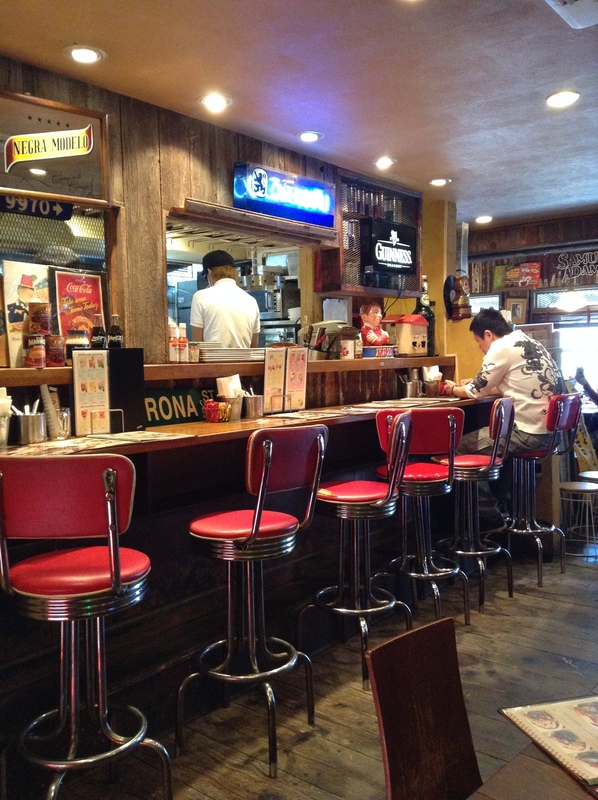 There are many burger shops in Tokyo that are trying to feel like America, this is one spot that has nailed the interior, music, and cuisine.